Exclusively on Audible. A Full-Cast Original Audio Drama for Ages 10 and Up. "For a small, pretty town, we are surprisingly good at providing the unusual, the unexpected, the uncanny...."
Moving from the big city to the picturesque town of Sunnypoint seems perfect for Dillon and her mom. But the new house - a big, old Victorian - creeps Dillon out, especially the old trunk in the attic that seems to move by itself. As if that weren't bad enough, the tight-knit popular girls at her new school hate her instantly. Dillon finds solace with the quirky kids - Quinn, the film nerd, Birdie, the back-of-the-class wit, and Kumail, the history fanatic. Together they find a mysterious necklace in the trunk, and when Dillon wears it, all of her wishes seem to come true. For once the power may have shifted in her favor. When one of Dillon's wishes is taken too literally, though, Quinn disappears, and she can't seem to wish him back. And her mom is suddenly acting super weird. Digging into the history of the house and its original owner, the kids decide maybe it's time to explore some darker magic to find Quinn. To undo what they have unleashed, they will have to delve into the deepest, darkest secrets of Sunnypoint - and face the lurking evil head on. Welcome to Sunnypoint. Hope you enjoy your visit. ©2017 Breakthrough Entertainment, Inc. (P)2017 Audible Originals, LLC. This is more like an old timey radio play than a traditional audio book, with a full cast and sound effects. It's broken up into 12 parts, but each one has a cliffhanger so you'll definitely want to binge it. It's for kids, and it's creepy--no spoilers, but ghosts and other supernatural stuff makes this a great Halloween listen. I purchased this for a soon to visit 10 year old nephew who loves scary books and thought it would be something he would enjoy. I was right: he loved it and so did I! He listened to it twice during his visit and told me he can't wait for the next installment. For myself, this harkens back to the radio programs of the 40's and 50's. Excellent story, very good production values and mostly all the performances are spot on. Like my nephew, I am looking forward to Volume 2! I chose this knowing it was made for children, but I really enjoyed it! I love the style of this audiobook. It's like watching a movie with your eyes closed. There are tons of sound effects and music to help fill in what's going on. I was never confused who was talking, or where the scene was taking place. I wish all audiobooks could have a narrator for every voice. I can't speak to how entertaining this would be for a child. It might be a little creepy for younger children (I would have been scared, but I was a chicken). Listening to this as an adult, I did roll my eyes at some of the dialogue, but it was fitting considering the intended audience. I think story is good, but the real reason to get this audiobook is for the unique listening experience. Please make more like this, Audible! I know it is geared toward kids but I loved it. It was a cute story and the cast and sound effects were awesome! 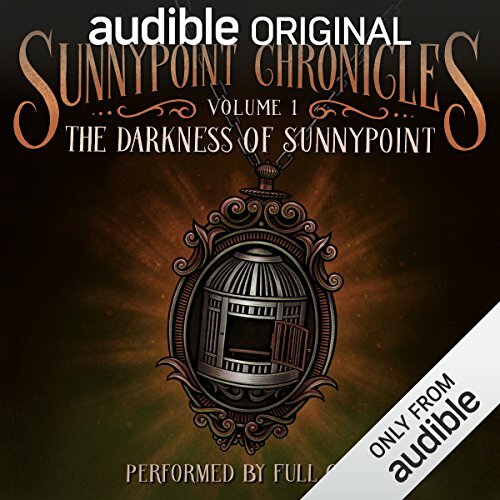 I'm always on the lookout to try out audiobooks with a full cast of narrators. This one was great! It is like listening to a radio drama. The narrators did a wonderful job of making the characters and story come to life. I would label this as a Young Adult Urban Fantasy but it's a solid story that can appeal to anyone that wants to listen to an engaging adventure story with an eerie twist. The story is complete within this book and you're left with a little bit of a teaser for what may happen next. I will definitely keep an eye out for the next audiobook. Great performance and solid story that kept me engaged from the start to finish. I thought the story line was great however the sound affects were distracting and made it a bit cheesy. Just a fun teenage haunted house book. The acting and the storyline was good but the sounds effects and spooky music were a little contrived. But still a fun easy read. In this full production audio, it's a little bit Stranger Things meets House on Haunted Hill with a pinch of Riverdale. Fun, intriguing and easy to get lost in, the story had some interesting points and a few flat moments in the narrator areas at times. It was pretty good. Nothing like an old house with secrets to stir the imagination. Most of the characters were well played. I wasn't crazy about the narrator guy - he sounded like a lesser version of Carl Sagan. His inflection was bothersome.